Hi I hope you had a great Christmas 2014! Just a super quick post to say that I am so excited to have received an email just before Christmas confirming that I have been shortlisted for the 2015 National Geographic Photo Competition. I am amazed and humbled to say the least! The Judges will be deciding over the coming few weeks so fingers crossed although it is obviously fantastic to have been shortlisted as a finalist in any event. 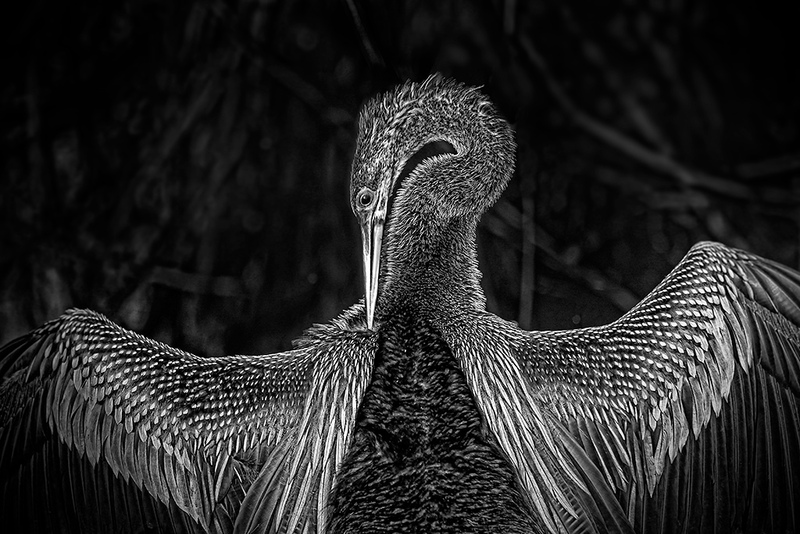 I entered my image into the wIldlife category of the competition and it is my black and white portrait of an Anhinga in the Florida Everglades. The bird is also known as an American Darter or the Snakebird as it is often seen swimming with just its head poking up above the water. The Anhinga do not have waterproof feathers and so must dry themselves off after every fishing excursion. I had been watching a few fishing for a little while and then without warning this particular individual had obviously had enough and just flew up out of the water and sat there waiting for the Florida sunshine to dry him off! It was a magical moment and i hope I did it justice in capturing the Anhinga in all its majestic glory. I hope you (and the Judges:) like the image as much as I do too! For more of my wildlife pictures, please click here.